Books Online: Now you see them – now you don’t! Perhaps the biggest news in recent days was the decision by UK retailer to initially remove all Kobo e-books from their online bookstore. The decision was made following complaints last week to WH Smith about the content of ‘unacceptable titles’ which contravened guidelines of the self-publishing and distribution platform. WH Smith released the following statement after deciding to replace their online store with a holding page. “Last week we were made aware that a number of unacceptable titles were appearing on our website through the Kobo website that has an automated feed to ours. This is an industry wide issue impacting retailers that sell self published eBooks due to the explosion of self publishing, which in the main is good as it gives new authors the opportunity to get their content published. However we are disgusted by these particular titles, find this unacceptable and we in no way whatsoever condone them. “It is our policy not to feature titles like those highlighted and we have processes in place to screen them out. We offer over one million titles through our eBooks partner Kobo, many of which are self-published titles. Due to the massive amount of self publishing a number of these titles have got through the screening process. “We are taking immediate steps to have them all removed. While we are doing this we have decided to take our website off-line to best protect our customers and the public. Our website will become live again once all self published eBooks have been removed and we are totally sure that there are no offending titles available. When our website goes back online it will not display any self published material until we are completely confident that inappropriate books can never be shown again. Dear Author reports today that Draft2Digital, a smaller self-publishing e-book service who load their books to Kobo, may be the source of the offending titles. DA reproduce an email sent out by Draft2Digital informing authors about Kobo’s decision to pull the company’s titles from its catalogue. Kobo has not removed titles supplied by other e-book content suppliers like Smashwords, and Dear Author states that Draft2Digital does not have filters in place like other content suppliers. The WH Smith online store remains unavailable, as of today, (with just the holding page) and it looks like we have reached the inevitable stage of multiple finger-pointing and the often-used sledgehammer approach to crack a nut. The State of Your Book! 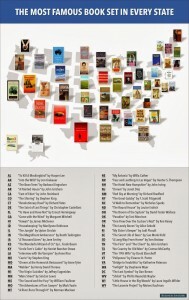 Business Insider has released an infographic detailing the most famous book in every state of the USA. The full details and text of the article can be found here. 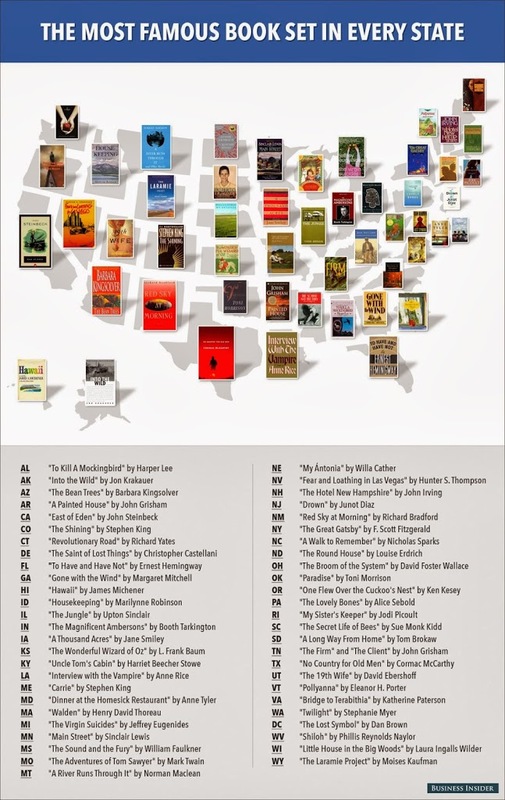 Though it makes for an interesting infographic (and I’m not sure how many people outside the USA will be interested in this), I can’t for the life of me find anything in the article that actually informs readers where the data to conclude the most famous books came from. Perhaps it is just arbitrary. Either way, see if you agree. Author Sales: Now you see them – now you don’t! John. R. Clark, Managing Editor at AgeView Press, has a guest post over on Jeanette Vaughan’s WordPress blog and raises some questions about the accurate reporting of book sales to authors on Amazon and its self-publishing platform, Createspace. “Due to the print on demand status of Createspace books, sometimes they are one or two books ahead. Thus even though your book was printed in one month, but sold in another, a royalty might actually show up in the prior month for that sale. What??? I can already see Aaron Shepard reaching for his abacus and implementing CreateSpace/Lightning Source Plans C to Z to deal with this!